It’s me, my feisty, sweet 7-year-old Abbey, and my other baby, a silver Tesla Model S we call Vivienne. The only requirement of the next two months: We must be in Texas in exactly one week for my little sister’s wedding. The tour will be powered by free supercharging. My 60kWh battery has just under 200 miles of range and takes approximately 45 minutes to charge, perfect for testing Tesla’s U.S. charging infrastructure. If my little battery can make it across the country, the higher-range Teslas should have no problem. She laughs, knowing nothing will stop me. I’ve always wanted to do this, and after the most recent episode of my perpetually disastrous love life, I’m more motivated than ever to start something new. “Mom, are we on Mars?” Abbey asks sleepily, rubbing her eyes. I pinch the 17-inch touchscreen in the dash, scaling out the map to show L.A. in relation to where we are now. Red rock, cactus. Silence. Even the rain is peaceful here, edging off the heat. I explain that Sedona is a spiritual place, a chakra of the Earth. She is more impressed that the ice cream cones have sprinkles. We see a storefront across Main Street called ‘the Crystal Vortex” with neon “PSYCHIC READER” written across the front. We wander in, absorbing sparkly gemstones, mystical figurines, mandalas, and aromatic candles. I notice two teenagers trying on mood rings. “How do you know what the colors mean?” I ask the round-eyed young man with brown skin and perfect eyelashes. “Oh, here’s the code,” he responds pointing to the cardboard insert. Before getting back on the road, we visit Slide Rock Park. As we walk down the trail to the swimming hole, we see a sign that says “Be kind to unkind people, they need it the most.” Abbey runs ahead and I marvel at her tiny frame compared to the grand mountains to her left and right. 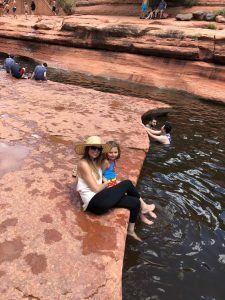 She swims joyfully in the crisp water of Oak Creek, surrounded by majestic rock formations and a larger than expected crowd. We sit together holding hands, connected to each other and the earth. Our feet gently move through the water in figure eight. I notice my nail polish is chipped but it doesn’t bother me. One moment could feel like an eternity in this state of peace and warmth… and I am savoring it. There are only four chargers, the smallest supercharger stop I’ve ever seen. I pushed the button on the plug but the charge port door didn’t open. Opened with the car controls, plugged in and nada. Tried all 4 chargers and nada. No power. This is very unusual. Called Tesla. They offered to tow me west to Holbrook AZ, the charger I just came from! After I explained, Tesla offered a complimentary tow to Albuquerque, the next Supercharger on our route. Over 140 miles! By the time our tow arrived, it was 11 p.m. 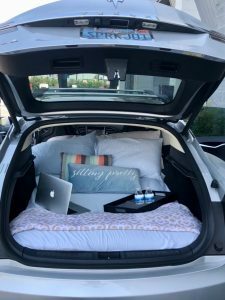 I asked if we could sleep in the Tesla on the way, but apparently, that’s “against the law” and “extremely dangerous.” Once on the road, Abbey asked the driver, “Hey, mister, can I steer the truck?” We had a hearty laugh. The friendly young driver explained that he had taken longer than expected because one of the trucks broke down. “Nothing works here,” he said. I had to agree. 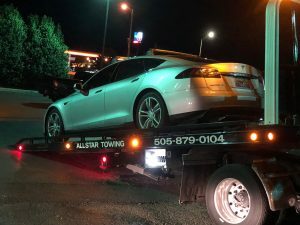 “Why was the Supercharger down though?” I wondered aloud. He wasn’t sure either. It was definitely working earlier in the day, he was certain of that. Still having fun but this little snag has me sweating time. With a long stretch between chargers, and an eye on my range, I’m learning I use less battery on cruise control. I’m also learning it feels insane to drive 50 mph on an empty two-lane highway in the middle of nowhere… but if that’s what I have to do to get from Childress to Ardmore, that’s what I’ll do. In some remote areas, I lost all cell reception, yet this computer I’m driving still had premium connectivity, satellite-view maps and music streaming. We are three hours north of the venue. The wedding is tomorrow evening. Blood pressure returning to normal. Upon our arrival last night, I parked, ran to the pool, and jumped in fully clothed. Yep, being in a car two days straight will do funny things to a person. Alert from Vivienne: Low tire pressure!! Turns out, there’s a screw in her tire. Seriously? I just have to laugh. The thing about being on the road, it’s moment to moment. You never know what will happen next. So much living packed into short periods of time. And THIS is why I love it. It keeps me present. The timing of this screw debacle is unfortunate. But as long as I get it fixed tonight or in the morning, we’re good. Barely made it to Lake Conroe for Eden’s wedding! Twenty minutes late, parked in a NOT legal spot, ran inside just in time for the vows! Abbey met her cousins, Amelia and Scarlet, for the first time. I had the honor of giving the bride’s toast. 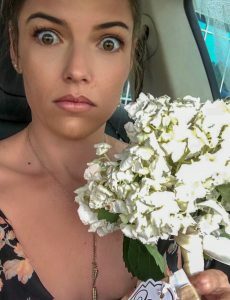 To top it all off, guess who caught the bouquet? I even got a pic of the newlyweds in front of Vivienne. He assured me, “He is one of the good ones. Eden has never been happier.” Another family member overheard, and chimed in, “I was wary too, at first, but that ended when I heard how he proposed.” A year ago, Mike had returned from an out-of-town work trip, and on one knee with a ring, he asked my sister to marry him. He also bought another little ring and proposed to Scarlet that day too. Good Morning, Houston. I wake up in the driver’s seat holding a wilted bridal bouquet. Check the rearview to see Abbey asleep in the back and still lamenting the rogue screw that could have ruined everything. It’s the day after the wedding and we are plugged in at the Service Center. OK, I confess. I drove from Dallas to Houston with a screw in my tire. Risky, I know. But the tire guy up north said he could fix it… after a four-hour wait. There was no time! So, he filled my leaky tire, wished me luck, and sent me on my way. Crossing my fingers, I drove, determined to make it to the wedding. Tesla Service is offering to sell me an expensive new tire. 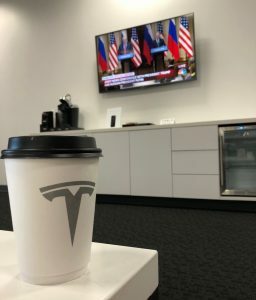 No thanks, Tesla… but I will help myself to a complimentary coffee and catch up on the news in your lovely waiting room. Then I’ll take it to America’s Best tire chain who repairs these slow leaks for free. A former flight attendant, Tiffani A. Van Ee now balances her time as a travel writer, professional organizer, and single mother living in the Greater Los Angeles Area. She earned a Bachelor’s degree in 2011 from UC Berkeley and worked as a grant writer in Hawaii. 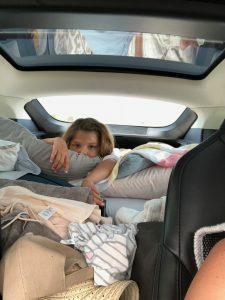 Tiffani recently returned from a 10,000-mile cross-country sojourn in an electric car with her 7-year old. You can follow along on her continuing adventures on Instagram at @TeslaMom.usa	Contact the author. I have already had the opportunity to congratulate you on the inspiring and challenging journey, but I would like to congratulate you again on the text and your story. Love this!!! I feel inspired. I haven’t been much of a Tesla fan, but this may just change my mind. Looking forward to the next installments.